There is a clear need to reduce road salt use in Canada due to its adverse environmental and socioeconomic effects. To date, research and development regarding the improvement of winter maintenance practice has primarily focused on roadways. 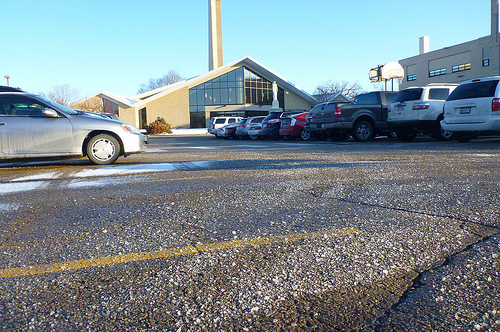 However, best practices for snow and ice control on roadways do not typically apply to parking lots, which are subject to distinct winter maintenance requirements and environmental conditions. Determine the condition variables that affect the performance of rock salts, brines, and alternative chemicals (including organic de-icing products). Determine the optimum application forms and rates for deicing and anti-icing treatments of parking lots and sidewalks over the expected range of pavement and environmental conditions. Develop models that can be used to forecast pavement surface conditions, such as residual salts, snow and ice cover, and friction, under specific weather events and treatment schedule. Develop guidelines and decision support tools for snow and ice control of parking lots and sidewalks, including material selection, salt application rates and treatment strategies.